« Please hold. Your call is important to us. A year after five unidentified victims who died during the construction of the Duffy’s Cut section of the Philadelphia and Columbia Railroad in 1832 were buried in Bala Cynwyd, Pennsylvania, the remains of another Duffy’s Cut worker have been returned to Donegal and laid to rest. His name was John Ruddy of Inishowen, and he traveled from Londonderry to Philadelphia on the barque John Stamp in June of 1832 to work on the railroad. A few months later, his body was dumped into an unmarked mass grave with an axe hole in his skull. Duffy’s Cut, named after Philip Duffy, a fellow Irish immigrant who had moved to the US in search of his fortune, was a particularly gnarly piece of railroad 20 miles west of Philadelphia. Duffy’s contract with the Philadelphia and Columbia Railroad required him to level a hill and fill the adjacent valley with the clay, shale and stone spoil. Once flattened, the area would be able to accommodate tracks. To accomplish this backbreaking task, Duffy turned east to the motherland, seeking out in his own words “a sturdy looking band of the sons of Erin” to work incessantly in horrendously cramped and unsanitary conditions for a pittance. Historians believe John Ruddy was one of 15 from the John Stamp hired by Duffy to move a hill into a valley. Things did not go as planned. The laborers were housed in a shanty on the work site, their sole source of water a contaminated stream. Cholera struck. As people began to die, the rest of the workers were forcibly quarantined in their shanty. They were expendable. There was no attempt to save them, and in fact, the skull damage suggests that all six of the people found in a mass grave died not from cholera but rather from violence, probably inflicted by the Pinkerton-esque “security” personnel of the East Whiteland Horse Company who were hired to enforce the quarantine. William Watson, a history professor at Immaculata University, and his twin brother Francis, a Lutheran minister, have been investigating the tragedy at Duffy’s Cut ever since they found a file in their grandfather’s belongings describing the railroad’s 1909 investigation into the events. Their grandfather, Joseph Tripican, was the assistant to Martin Clement, president of Pennsylvania Railroad in the 1940s and the man in charge of the investigation in 1909. The Watson’s found that the railroad’s internal findings of 57 dead at Duffy’s Cut contradicted press articles from 1832 which downplayed the situation and said only eight or nine people had died. After much permit filing and grant requesting, the Watsons collected some volunteers and put their own money into an excavation of the site in August 2004. 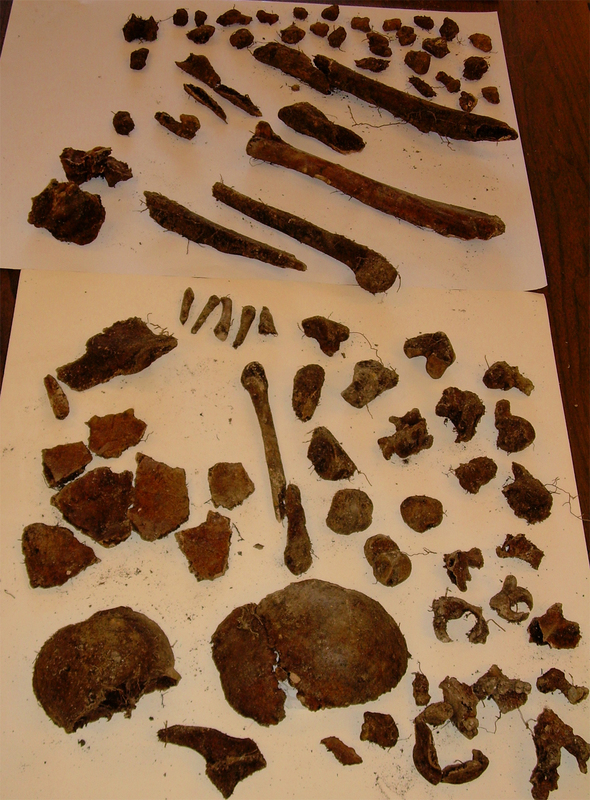 They didn’t find any human remains until almost five years later, in March of 2009, when they came across the shin bone of a young man. Five other sets of human remains followed, but that first young man’s skull would provide the sole identifying information. He shares an extremely rare mutation — a missing upper right first molar — with the members of the Ruddy family, some of whom still live in Donegal and remember a family story of a young man heading to the US with stars in his eyes in the 1830s who was never to be heard from again. 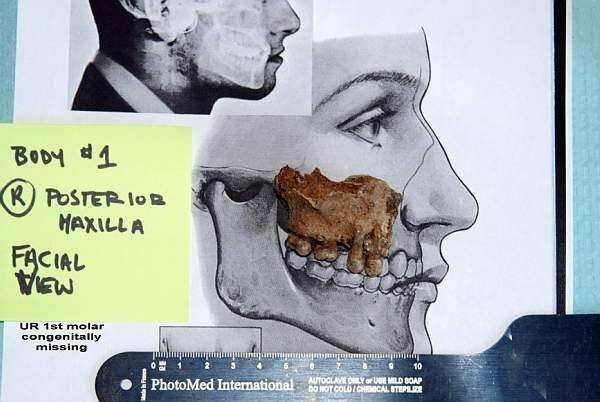 Although there hasn’t been sufficient funding to confirm the young man’s identity with DNA testing, the age of the bones, the missing molar and ship’s manifest all strongly point to him being John Ruddy. Instead of keeping his remains in a lab indefinitely until the project gets enough money to perform DNA analysis, the original Duffy’s Cut researchers William Watson, Frank Watson, and Earl Schandelmeier decided to send the remains back to Ireland for a dignified burial. 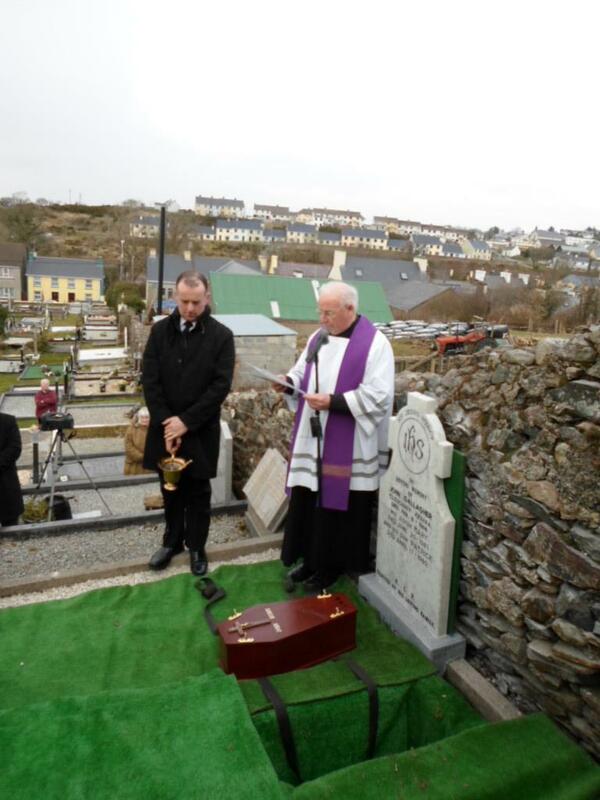 On Saturday, March 2nd, 2013, the mortal remains of John Ruddy were buried in the graveyard of the Church of the Holy Family in Ardara, a town in Donegal next to Ruddy’s home of Inishowen. The plot was donated by Vincent Gallagher, an Irish immigrant and president of the Commodore Barry Irish Center in Philadelphia. He and his family are from Ardara, and they gave up one of their plots for Mr. Ruddy. Gallagher also put the Watsons in touch with local funeral director Seamus Sholvin and parish priest Canon Austin Laverty. The casket was carried to its final resting place by Earl Schandelmeier, a Historian at Immaculata University, which was the driving force behind the Duffy’s Cut project, accompanied by three pipers in kilts. They were closely followed by Sadie Ruddy, who lives in Portnoo, and her first cousins James and Bernard Ruddy from Quigley’s Point, all three of whom are direct descendants of the deceased. 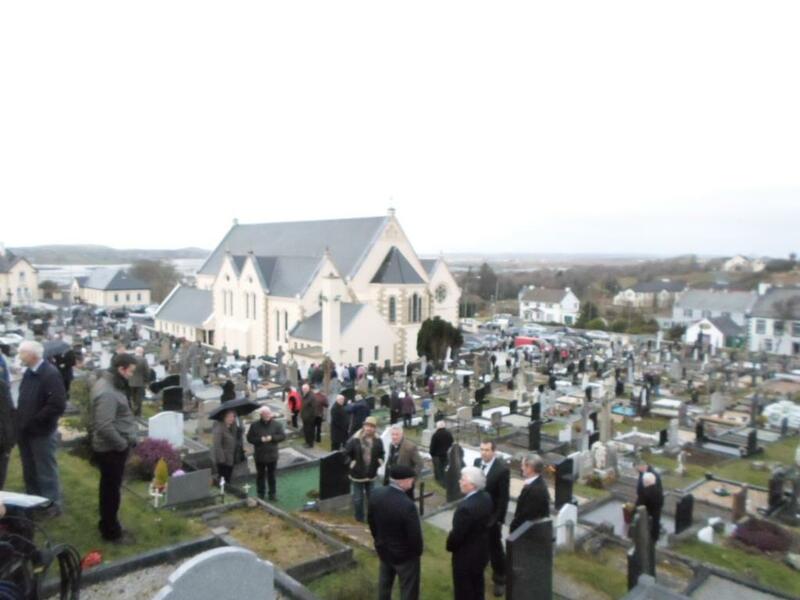 Looking out across the graveyard towards Loughros Bay and the Atlantic Ocean beyond, Canon Laverty noted that Slieve Tooey – visible in the distance – was possibly the last piece of Ireland that Mr Ruddy and those who left Derry in 1832 saw through the mists of their tears. That’s William Watson, Frank Watson and Tom Connors playing Amazing Grace on the bagpipes. The Duffy’s Cut Project isn’t over yet. The Watsons are still working on getting permission from Amtrak to excavate what ground penetrating radar suggests is the major mass grave where the cholera victims were interred. They hope that any remains that can be identified will be returned to Ireland for burial. This entry was posted on Saturday, March 30th, 2013 at 3:43 AM	and is filed under Modern(ish). You can follow any responses to this entry through the RSS 2.0 feed. You can skip to the end and leave a response. Pinging is currently not allowed. The evidence is thin, it’s true, but it’s not non-existent. The molar evidence is significant, for instance. The Watsons have been working on doing justice to the dead of Duffy’s Cut for years, long before anyone in the press paid them any attention, nor did the the John Ruddy connection result in some great avalanche of attention. It was the general news of the excavation and, years later, the reburial of the deceased that caught the eye of the media, almost all of it local press. There’s no payout here. What on earth are you talking about. What molar evidence is there for instance. The Duffy’s Cut information was not know to anyone because it was kept secret by members of the Watson’s family group among others. I have been in touch with the Watson’s on a number of occasions after the release of the program The Ghost’s of Duffys Cut, they have consistently been evasive with their reply and indeed when I got in touch with their facebook page(from which i am now bolcked)they were more than ever elusive. Why they have taken the route they have has nothing to do with doing justice to the dead of Duffy’s Cut but more to with self glorification. If at this point they were able to prove that these were indeed the remains of John Ruddy they would be worthy of praise but to make the claim based on nothing is dishonest and that is unforgivable. to John Ruddy? Get a life. There is a difference between truth and fiction and the Watsons still claiming that the remains returned to Ireland are those of John Ruddy is fiction and this brings into question the rest of the theory that these 2 attention seekers have came up with. The Watson are looking for some sort of notoriety re this matter and in my humble opinion to make claim that these remains are those of John Ruddy without definitive proof is quite simply a lie along side other distortions of facts that these two came up with. If you like deing lied to fine but but I think it is you who needs to get a life. I suppose you would believe the earth is falt if the watsons told you so. An offer was made to have the remains buried in Inishowen but the Watsons decided against it in preference to the generous offer made by Mr Vincent Gallagher. The Inishowen offer was to be a quiet buriel rather than what took place at Ardara so it seems this did not suit the attention seeking Watsons. One of our Duffy’s Cut dig crew brought the History Blog discussion of Duffy’s Cut to my attention. Debates in the public domain are one thing, but slander is another. I am astounded by the various arguments made by Patrick Ruddy, as I had only a few exchanges with him early on in our work, and then right before the Ardara re-interment. I am unaware of any exchanges he had with anyone else at another time, but it was certainly not with me. I certainly have not logged into this site before and I have been unaware of any previous postings herein. I routinely instruct my students that intelligible debate on any subject depends on several preconditions: a proper understanding of the issues, an attempt at objectivity (my seminars have read E.H. Carr and Marc Bloch, and discuss Benedetto Croce, on such things), and finally, an ability to think critically. Patterson and by Janet; information from the railroad file about the workers (published in our 2006 book entitled The Ghosts of Duffy’s Cut); information from the ship records about the ages and birthplaces of the workers (also published in our book); standard genealogical protocols to locate those workers; and finally, the determination by the Chester County coroner in a statement issued on the remains which we took with us to Ireland, stating that the deceased was “John Ruddy,” 1814-1832.
own relatives I can forward to him in this regard. There needed to be certainty of DNA prior to any Inishowen interment. But because we have no money with which to pay for DNA work, and UPenn does not have a DNA lab, and because John Ruddy was not King Richard III and could not therefore get the kind of financial backing necessary, this part of the project has not been completed. The remains have been on the back burner of a lab elsewhere for two years–very frustrating to us–but we do expect there to be some success at some point. We cannot press the issue when we are having it done gratis for us. The DNA graciously provided by Ruddy family members at the ceremony in Ardara is safely in storage with Matt Patterson and he will begin the process of trying to link that with DNA from the remains in a separate set of tests. There will then be two labs trying to get the results. But this cannot happen tomorrow, because we still have no funding for the project. And for crying out loud, we are trying. We are not just sitting on the sidelines bellyaching about it. All this begs the question, of course, that if Patrick Ruddy insists–without any evidence–that SK001 aka “John Ruddy” is not John Ruddy, a distant collateral ancestor, then why does he care about where the remains were buried? 1.Lines of communication. I have had only a few cordial email exchanges with Mr. Ruddy, when we began our research and again immediately prior to the re-interment of SK001, aka John Ruddy, and not huge, ongoing debates with him about those remains. I do not administer a Duffy’s Cut Facebook page, so therefore I do not control its content nor do I control who can participate in it. If outrageous, unsubstantiated calumnies would be uttered in such a forum, however, I certainly would not expect informed administrators to shut down useless slander in the public forum. I would certainly rather discuss these issues face to face with Patrick, and have him see our Duffy’s Cut Museum at Immaculata, meet our team, examine and artifacts we excavated, visit the grave and ledger at West Laurel Hill Cemetery, rather than than have him lob unsupported bombshells across the Atlantic from behind a computer. This takes up my time, which I need to devote to my daily academic job. I want to stress that I do not participate in Facebook discussions of any sort. I did not bar Patrick Ruddy from using anything. If, however, he was as irresponsible on Facebook as he has been here, I would not object to the idea of his being barred from using such an entity as a platform to utter unintelligent and slanderous speech. One is reminded of the unfortunate case of David Irving. 2. Patrick Ruddy claims we have made money on the project, and that is why we have persisted in the project. This is ludicrous. We get 25 cents per man for each of the four authors of the book, The Ghosts of Duffy’s Cut. The publisher, like all academic presses, makes almost all the money. We earned nothing from Tile Films, LTD, of Dublin, which produced the two documentaries, or the networks that broadcast them, entitled “The Ghosts of Duffy’s Cut,” and “Death on the Railroad.” We paid our own money to ship the remains to Ireland; we paid our airfare to and from Ireland; we paid our transportation in Ireland; we paid for our accommodations in Ireland. We did what we did on this project as though we were the fathers of that poor man and because we and our colleagues are singularly interested in doing justice by him and his fellow Irishmen. Vince Gallagher and Kathy Burns of the Donegal Society in Philadelphia were also moved by the story of John Ruddy, and they personally helped us out of the kindness of their hearts. We did not make money on this. It is disgusting for Patrick to make an accusation like that when he has absolutely no knowledge of the financial matters of this project. 3. This entire project has been conducted openly, with hundreds of public talks, articles, and radio and TV coverage. There is no “secret” information hidden by my family. That is a paranoid and baseless accusation, which again, brings to mind the unfortunate case of David Irving. Oh dear this nhas raised it ugly head again. To be honest I now find this all very boring now. I have not read this in full at the moment but going by my undestand of what I have seen so far comments like “We are not just sitting on the sidelines bellyaching about it. All this begs the question, of course, that if Patrick Ruddy insists–without any evidence–that SK001 aka “John Ruddy” is not John Ruddy, a distant collateral ancestor, then why does he care about where the remains were buried?” is akin to comments made by frank watson on the facebook page which suggested I had some issue with Mr Gallagher offer of a grave(which I do not and have never suggested such). This comment is a cop out mr watson, “I do not administer a Duffy’s Cut Facebook page, so therefore I do not control its content nor do I control who can participate in it.”. Someone once said that dealing with Michael Collins is like writing on water, just like dealing with farnk i think. Anyway as I said this has become all very boring but I will give a fuller reply at a later date as i have other things more important than this to deal with. P.S. as for my kith and kin as you put it this has nothing to do with them and need not be brought into this. I am chiming in here to add to what my brother William wrote above — this seems like a rather insane, slanderous diatribe concerning the proper reburial of Irishmen who were murdered and dumped in an unmarked, anonymous grave at Duffy’s Cut in Pennsylvania in 1832. To be clear, the gentleman above would not even know about Duffy’s Cut unless we had brought the story of Duffy’s Cut to the light of day. The Duffy’s Cut Project discovered and reburied the remains of Irish railroad laborers who died of cholera and murder at an area called Duffy’s Cut, in Chester County, Pennsylvania. In what universe is it “wrong” to right such a historic injustice? Furthermore, the “Watsons,” Earl Schandelmeier, and our professional colleagues have funded this project mostly out of our own pockets for nearly twelve years now. It is, frankly, a lie to say that we have made “money” on what has been a labor of love for over a decade now. What on earth does the gentleman above mean by saying that we “made money” on Duffy’s Cut? Money from whom???? Money to whom???? That is an absolute untruth. But, of course, that is why the gentleman above was banned from the Duffy’s Cut Facebook page a year ago now, for deliberately misrepresenting the truth, and for posting lie after lie and slander after slander. Morally speaking, the gentleman above needs to apologize to the entire Duffy’s Cut Project team. Just for the record, we paid for our flight to Ireland last March to rebury the first man we discovered at Duffy’s Cut in Ardara out of our own pockets — NO one paid for our airfare or for our accommodations. WE PAID OUR OWN WAY. The gentleman above had better check his facts in the future before he slanders or libels anyone else. Mr. Ruddy, YOU are the one who is “raising” this ugly head” again — the Duffy’s Cut Project discovered and reburied the remains of murdered Irishmen — WHY DO YOU HAVE A PROBLEM WITH THAT???? You “find this very boring”???? Slandering men and women who have given of their time and resources to give a proper burial to Irishmen denied such in 1832??? “Boring”? Frankly, the lack of moral responsibility on the part of an individual who feels free to continuously libel and slander those who have done him no harm is not “boring”; it is astonishing. As I said on your face book page how were people to know abot this when menbers of your family kept secret. A respose you took exception to and denied there was any secrecy. I sent you the sound recording from your film the The ghosts of Duffy’s cut to remind you this was what was said on the film or have you decided to forget that? Once again you repeat a lie — my family did NOT keep this a secret. If I was an Irish citizen you would be sued for libel, and you would most certainly lose. Once again you have slandered my family. To repeat what I told you over a year ago, and to repeat what has been in the popular media for a dozen years now, no one in my family kept the story a secret. We both preserved it and brought it to the light of day; my grandfather was the one who preserved the railroad file (he did not compile it; if you saw the two documentaries, that would be obvious). It is a FACT that if we did not bring the story to the light of day you would never have heard of it. How on earth can you deny that fact???? Furthermore, you never sent me a recording from our first documentary; that is also a lie. But why would we need a sound recording of the documentary, since it has been shown continuously on the Smithsonian Channel in the United States since it first aired? You, sir, need to apologize to our entire team, and to my family. So your grandfather can not be seen as one of your family group, strange. As for the recording because you blocked me on your facebook page I sent it to your brother and asked him to forward it to you, could be a good idea to talk to him but if you give me your e.mail address I can send it direct to you. For william watson. When i started to read your post I began to think it possible that we may have been able to have a sensible discussion re this matter but the intervention of your ankle biting brother and further read of you post now make this impossible I would think. You like frank are distorting what I am trying to say. I.E. implying I have some problem with where these remains were buried is nonsense. My private thought on this matter is that the remains should have been buried in PA along with the others but I have never commented on this up to now. For frank to come on here bleating liar etc quite frankly(no pun intended) is disgusting. By your own admission your grandfather (who frank seems to think can not be seen as part of your family group) was instramental in the continued secrecy of the exsistance of the so called Duffy’s Cut file. Must go but will get back to you on this as I dislike being called a liar by you or anyone else and I will not rake this lying down. We shall in time find out who the liar is and it ain’t me. “various arguments” This started out asone argument “ that to claim the remains buried at Ardara are those of John Ruddy is unsafe and was then expanded outwards because of the remark made by the ankle biter to the effect that nobody knew or cared about what happened to these people before you released this information. I would say that the turn out at the burial at Ardara and West Laurel cemetery will go a ways to ensuring such a comment will never be made again. You are correct we have had a few exchanges earlier and indeed were not in any way problematic. The problem arose when I contacted you facebook page and the ankle biter went off on one bringing things into the mix that had nothing whatsoever to do with my comment and also when asked (not by me I may add as I have made my position know on this) why was the remains not buried in Inishowen he simply replied “no other offer of a grave was made” which he then had to recant. Paragraph 3 “several things need to be clarified”. How you you are but we will get to those later. The first part of that we will deal with a little later. have never made any remark to this or what you instruct your students to read. Item 2 “The decision to call SK001 “John Ruddy” was not a random event.” ??? Its all very well saying this is not the time nor the time to engage in this that or something else at the end of day you have no conclusive proof that the remains buried in Ardara are those of John Ruddy and as we know people of many nationalities work to build the railroads in America you can not even be sure if SK001 is even Irish and also do you have proof that John Ruddy or anyone from the John Stamp worked on mile 59. The film death on the Railroad raises a whole bunch of questions but I will leave that to others. Item 3. We have dealt with most of that except the DNA which is in the lap of the gods it would seem. I would say at this point that in the end if the DNA of the remains at Ardara can be match to any Ruddy’s or any other family group for that matter perhaps the respect I had in you will return. Re visiting the team at immaculate there was a time I would love to have done same and indeed thought was given to this but ongoing health problems but that to bed I’m afraid. On the question of going to Ardara I was on the verge of making arrangements to do this but I changed my mind. The situation had go so bad then that I realised I was going with the wrong agenda because if I had met up with frank there he would have been play his bagpipes from a different orifice from the one he uses now. 2 Re the question of money being made was based on information passed on by a 3rd party and while I do not know whither it was true or false I did not take much notice of it but I suggested in out of anger rather than actual belief. 3 Don’t know anything about the unfortunate case of David Irvine could you explain. 1	No matter what there will never be any apology for anything I have said to this point. Don’t wold your breath William waiting for it but frank can. 2	Now that you have read the blog from the beginning perhaps you would take the time to straighten out the inaccuracies in the early part of whih in the end do your story a great disservice. I don’t understand your animosity towards this project. I understand your concerns, but I think that much of what you have said undermines the importance of this project. The crew working on this project already has enough hurdles to leap in order to make this project come to fruition and every step of the way it appears as though you are trying to stir up controversy. The venom you have spewed is appalling considering I cannot see how the Watsons have, or will ever, benefit significantly financially from those lives lost at Duffy’s Cut. When the project is complete can you expect a book and lecture tour from the Watsons? Yes, that will probably happen. But guess what? That is what people do when they work in historical research; they work hard, compile their findings and share those findings with us, the people, in the form of a book and lecture tour. Their hard work allows us the opportunity to know the story of Duffy’s Cut. Furthermore, their work is potentially exposing a massive injustice and/or one of the earliest pieces of evidence of what we now know today in America as “hate crimes”. When or if the Watsons write a book, I wouldn’t expect that it would benefit the Watsons significantly, financially speaking. I think you are missing the intentions of this project and are instead personally attacking those who have labored continually for the better part of a decade to bring us the real story of what happened. There are so very many secrets to yet be uncovered and I would hope that you would appreciate the hard work being performed. From what I have read, the vast majority of funding for this project has been through donations. The project itself is non-profit and is directly affiliated with a respectable university. I assume that you are looking out for the best interests of your ancestors, I appreciate this. From all that I have seen, many have banded together either out of the kindness of their hearts or for the sake of history to uncover the secrets of the fate of so many Irish immigrants. Additionally, I have seen no evidence of the bodies or stories of those victimized by either cholera or violence sullied by the work of the people on this project. In fact, if anything, it appears that they have gone above and beyond to make sure that those lost are honored. I think we can all agree that this project is important. Please be more positive and encouraging as being any other way is contrary to the project purpose. My apologies to Mr. Ruddy, I did not mean to call you Mr. Duffy. Mr Duffy just goes to show how easy it is to make a mistake. I really have no problem with the project as such or what it set out to achieve and indeed I praised this from day I came aware of it and was in touch with William Watson soon after. Clearly my surname being Ruddy and have links to Donegal and an interest in Genealogy goes a long way to explain my interest. 1 “Watson said **** Ruddy of the Inishowen Peninsula came out here and provided us with several (DNA) samples. We are awaiting results of the tests,” said Watson in reference to the remains identified as those of Donegal immigrant John Ruddy. This went on to say:-2 “He (****) is missing his top right front molar, like the excavated remains of John Ruddy we retrieved in March, 2009. This is a one in a million genetic anomaly” added Watson who said that **** Ruddy had told him that several other living members of his family also have the anomaly. The later part (2) of that statement is untrue, **** said no such thing and W & F Watson knew it.. Alarm bells started to ring at this point and I then had a further look into the yarn the Watson’s were weaving. This cast doubt in my mind as to the validity of the story. While some of it may be true I reached the conclusion that some of it was unproven and until proof was shown re these items then we are looking at theory(or fiction) and not fact and I believe the Watsons are trying to make us believe that their versions of event are true and without question. However at this point I kept to myself on these matters and waited to see how thing progressed. Last year however the Duffy’s Cut webpage was brought to my attention and what came over there was the same old stuff being rolled out. I decided at this point to ask was it safe to claim that the remains being buried at Ardara are in fact those of John Ruddy. This triggered a response from Frank that can only be described as childish at best and in my opinion just designed to demean me and I acted in kind. I.E. Frank made a statement to the effect that no one knew or cared about the people who died at the Cut before they (the Watson) brought this to light. I pointed out that no one could have known or cared about this as people including their grandfather had kept this a secret. Frank took exception to this remark and demanded an apology as I had insulted the team etc. I see now they are claiming their grandfather preserved???? the file. Lets look at that. Quote from the Ghosts of Duffy’s cut “ Were it not for a chance discovery of a secret file hidden away in an attic” The attic in question being their grandfathers and also note the words secret and hidden. 1 “This was something we knew from the nature of the file that this was not intended to get out into the public. 2 “After he died they found this file hidden amongst their grandfathers papers which was never supposed to see the light of day. In this case item one speaks for itself while again in item 2 we see the word hidden.. So we are to believe that a hidden file that was not intended to get to the public was in fact preserved. No secrecy claims the Watson’s PLEASE The world is round folks and you can be sure of that but trying to make folk believe that this file was “preserved” ????? First off, I must say I really admire what the Watson brothers are doing for the victims of this horrific crime. I also share a love and pride for my heritage the way they do. I do a lot of genealogy myself and have also done DNA testing. Have there been attempts to contact family tree DNA to see if they may be able to get a sample of DNA from the remains claimed to be Mr. Ruddy? What would something like this cost? When I first read Patrick Ruddy’s comments for the Watsons I thought, “Is this guy a Ruddy or a Duffy?” So I find it rather comical someone made the mistake of calling him this “post thought”. The truth is what I see from an outsider’s prospective is Patrick just stating that without concrete DNA results maybe the remains should have been kept here in Pennsylvania before returning them to Co. Donegal. This could have been stated in fewer words with less insult to family ties. Yes their grandfather had these files and they were considered top secret but to imply anything on the man’s character would be just as offensive to his person as it is to his kin. Maybe their grandfather researched this in 1909 and met just as many obstacles as his grandsons have. In our country the government obviously covered this up and looking into the history of railroad one would find it was somewhat as powerful a lobbyist then as Monsanto is today. It is not right for one to judge the actions of a whole family by the actions of one regardless of the facts. We know it isn’t uncommon for an Irishman to get hot before the pot is fully cooked. Agree to disagree and let’s see what we can accomplish with a common cause fellas. Would you use ghost stories as in part support you family history research. I think not but these 2 have used this to support their story. Remember that spectral evidence was used to hang the poor folk during the Salem witch trials. I thought he should have been buried in inishowen donegal too patrick..if he came from there ..so efffin sad ..
My heart goes out to john ruddy such a young boy to go through so much..but patrick is not stupid ..hes very in tuned with the goings on ..it bothers me a lot that he wasent buried in inishowen.. god bless patrick.